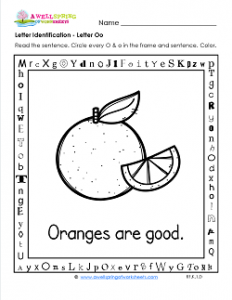 Letter O never looked so big and round, or so juicy and yummy until this letter identification worksheet for the letter O. Pictured in an alphabet letter frame, this orange should be colored what color? Orange! Of course. But don’t forget to find and circle all the o’s first. There are 12 in the frame, three on each side. Do your kids see o’s in the sentence, “Oranges are good.”? They should circle those, too. And don’t forget to look for the hidden sight word “yes” in the top part of the frame.